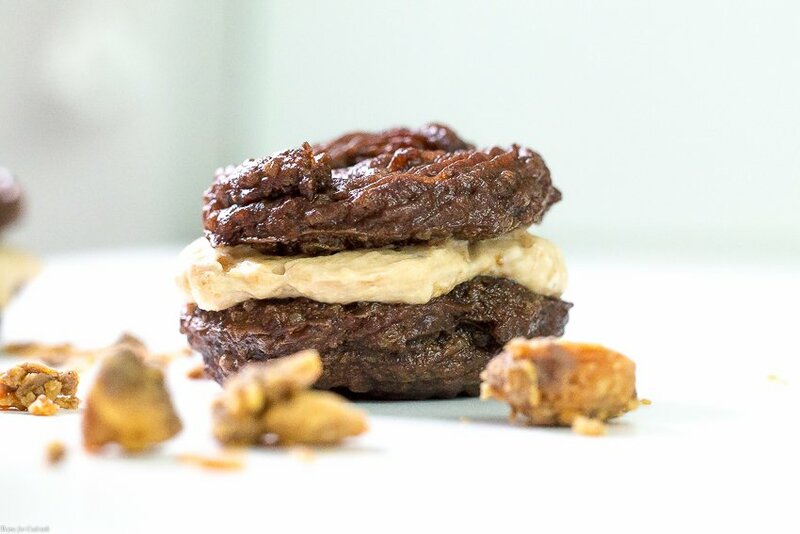 This shop for Brownie Churro Sandwich Cookies has been compensated by Collective Bias, Inc. and its advertiser. All opinions are mine alone. 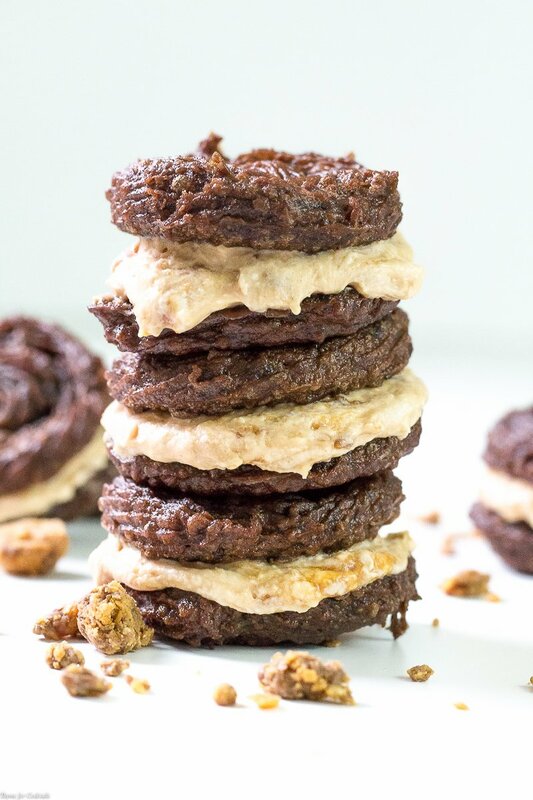 #mixinmoments #CollectiveBias Give traditional Mexican churros a real twist with these easy Brownie Churro Sandwich Cookies. 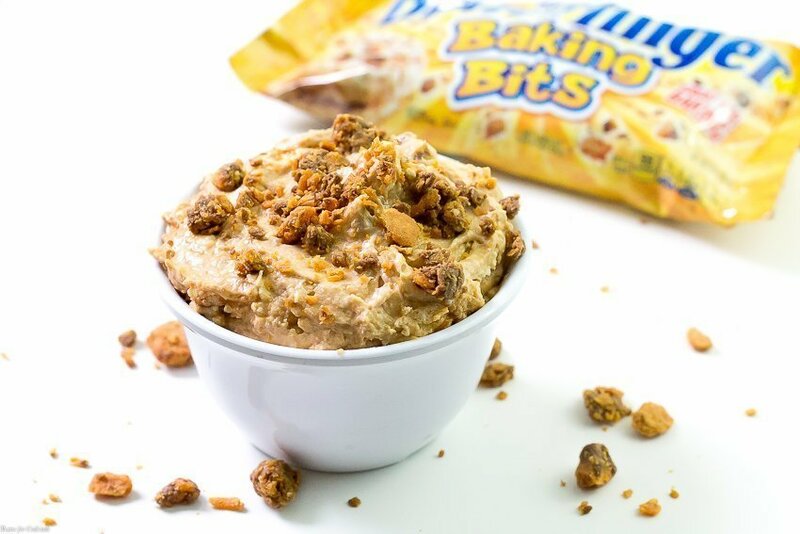 Crispy brownie batter churro cookies with a simple Butterfinger cheesecake filling! Sometimes life is an uphill battle. No matter how much you work at it, things just don’t go the way you hoped. That is how I feel about my husband Paul’s insatiable sweet tooth! He can devour a huge meal then 30 minutes later be digging around the casa kitchen looking for a treat. [bctt tweet=”Brownie Batter Churros #sweet #treats #easy #snacks” username=”thyme4cocktails”] I have learned to hide certain snacks from him, like ice cream, or they disappear in one sitting. NO JOKE! An entire carton will be gone in a matter of bites. Lucky guy has the metabolism of a teenage. As you can imagine it is tough to keep up with an appetite like that, especially when I try to make most everything we eat from scratch. Which is why I have delicious shortcuts like the new Nestle Toll House Baking Mixes from Target on hand for late-night munchie emergencies. Because he never wants to snack at a reasonable time. Oh no, it is usually later once we are almost settled in for the night. The first time I made churros was on a night like that. Needless to say it was definitely an experience! They were tasty, just not the prettiest churro on the block. 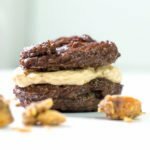 My technique has improved with practice and some really great recipes like these easy-to-make Brownie Churro Sandwich Cookies were born in the process. Because why not make churros out of brownie mix. Except I just couldn’t get the size and shape of a traditional churro. They were super crispy, but the batter didn’t puff up as much as I had hoped. We made nugget sized churros, super skinny mini-churros and even some that looked like soooomething else entirely! Finally it hit me. Why not make shapes out of the them. They needed to be thin enough to fry up nicely, but the surface area could be as big as we wanted. You could make circles, diamond patterns or even stars! But they were still missing something, plus I had a bag of Butterfingers candy from the mix. My original idea was to make a dip with the brownie churros chip-style on the side. And I highly encourage you to try it. And then my slightly greedy, snack-stealing husband grabbed two of the churro crisps; spread a healthy amount of dip between them and popped it in his mouth with a satisfied sigh. 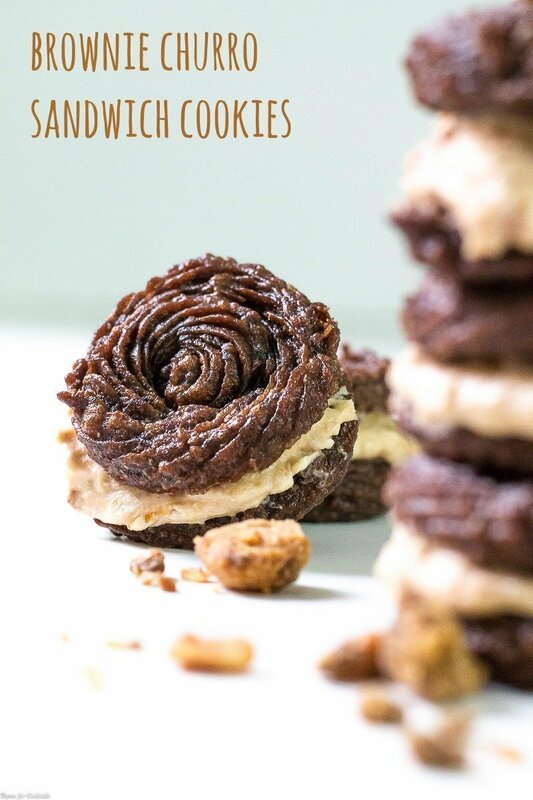 Hello Brownie Churro Sandwich Cookies! 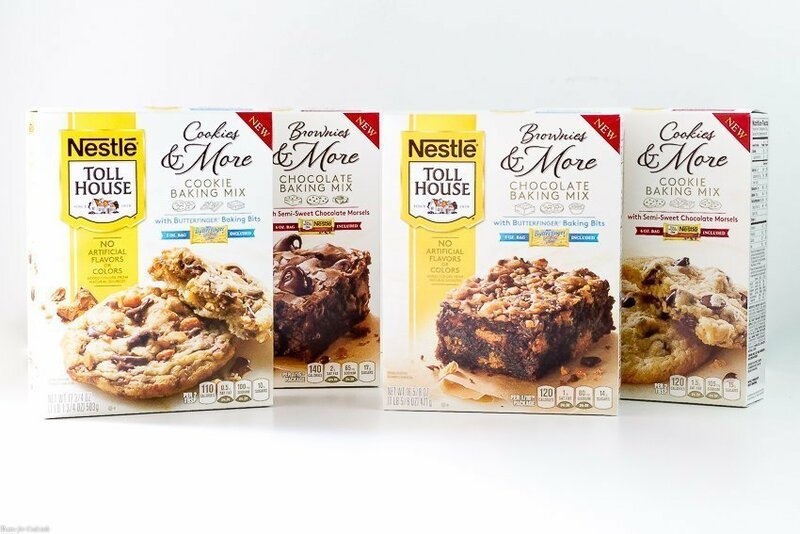 These Nestle Toll House Baking Mixes are great because they have everything you need to customize your treats with fun twists on classic recipes. Plus they don’t have artificial flavors or colors. I am excited to try a cookie mix churro cookie with peanut butter chocolate chip filling. There are 3 easy steps to make the churros. Mix. Freeze. Fry. And you can’t skip the freezing part. They need about 20-30 minutes in the freezer to firm up so they retain their shape while frying. But that is just about the time you need to whip up the filling. Which only has 3 ingredients too! Plus whatever you want to add in. Give traditional Mexican churros a new twist with these easy Brownie Batter Churros that are completely addictive once you dip them in a simple Butterfingers cheesecake dip! Add water and butter a medium sauce pan, bring to a boil. Remove from heat and stir in 1 cup brownie mix and flour. Stir vigorously with a wooden spoon until a ball forms. 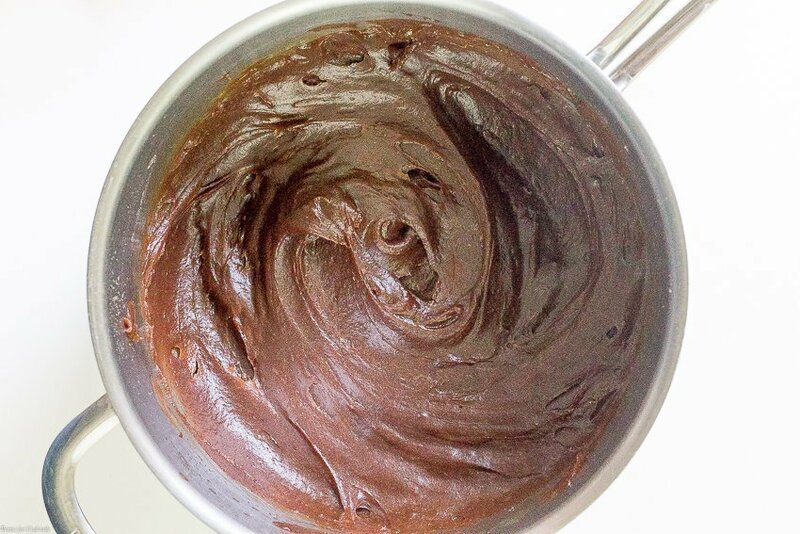 Add more brownie mix if necessary to reach that consistency. Let dough cool 10 minutes. Add dough to a pastry bag with desired sized star tip. Pipe desired shapes onto a parchment lined baking sheet. Place in freezer for 20-30 minutes. Make filling by beating together cream cheese, butter and confectioners sugar together in a medium bowl. Fold in candy pieces. Heat 1 1/2 inch oil to 375 degrees in a large Dutch oven. Working in batches, fry churro cookies until crispy. Approximately 2-4 minutes depending on thickness. Place on a paper towel lined baking sheet to drain. Once cool spread desired amount of filling onto half of cookies, top with remaining cookies.